According to the International Society of Aesthetic Plastic Surgery, nearly 650,000 cosmetic procedures were carried out in Korea in 2011. Although the figure puts Korea in seventh place in terms of the number of procedures carried out, Korea ranks highest in terms of the proportion of the population that has received treatment. Along with the rise in numbers, society’s negative perceptions of plastic surgery have eased significantly, particularly among younger people. “I think it’s a positive thing to be able to address the complexes you might have about your appearance,” said Yoo Hye-rin, a second-year high school student. She added that the common opinion among her peers is that eyelid surgeries aren’t a big deal, as they are so common. Cosmetic procedures have also come to be performed in an increasingly wider range of medical disciplines. A growing number of ophthalmologists offer eyelid surgeries, while many dentists have opted to specialize in orthodontics and teeth whitening to boost their income. Some dentists even perform “double-jaw” surgery, in which the jawbones are cut, realigned and then reset to create a narrow jawline. Despite the dangers and the long recovery period the procedure requires, an estimated 5,000 double-jaw surgeries are performed in Korea each year. Such developments are even affecting the considerations of medical students when they select their specialties. Plastic surgery, once among the most sought-after specialties because of the field’s high earning potential, is falling in popularity. “Becoming a plastic surgeon is no longer the way to go for medical students because, for one thing, there’s no guarantee that (cosmetic surgery) specialists are better than other doctors at what they do,” said Lah Jin-hyeon, a 25-year-old intern doctor said. For Korean society in general, however, plastic surgery is more popular than ever and has even come to be a normal means of improving one’s “spec.” Spec, short for specifications, is used in Korea to refer to an individual’s qualifications, which are now considered to include physical attractiveness. “I think getting cosmetic surgery helped a lot in finding a job,” a 29-year-old female accountant said, declining to be named. Although she graduated from a university ranked among the global top 10, she says that she never felt fully confident before she had a number of procedures done. Since graduating from university in 2007, she has had surgery on her eyelids and nose. She has also had braces and had two embedded wisdom teeth removed. She believes that these procedures have made the shape of her face more attractive. Although she may be an extreme case, surveys show she is not alone in thinking that good looks are an asset. According to a recent survey conducted by a Web-based recruitment service provider, as many as 30 percent of university students would consider getting cosmetic surgery to increase their chance of finding employment. Among local celebrities, plastic surgery has become so prevalent that it is perceived by the public as almost the norm. In areas where broadcasting stations are located, it is not unusual to see clinics advertizing their plastic surgeons are being “designated” by this or that broadcaster. Celebrity admissions to receiving cosmetic procedures have also become much more common. While such revelations were often used in the past by minor league celebrities as a tactic for gaining public attention, even full-fledged K-pop stars have joined the ranks of celebrities who are “out” about their plastic surgeries. Celebrities who have recently admitted to having had cosmetic surgeries include Super Junior’s Kim Hee-chul and Minzy (or Gong Min-ji) of 2NE1. As cosmetic procedures become more prevalent, the industry is targeting the younger generations. Marketing measures aimed at younger age groups include offering discounts for students who have taken the annual College Scholastic Ability Test. Despite the popularity of cosmetic procedures, not everyone, particularly those of the older generations, has accepted the trend. “I think it’s reckless to cut bones and put things in your body just to look better. It’s not as if your DNA changes,” Choi Myeong-duk, a 64-year-old retiree, said. He added that he would oppose the idea of his children getting plastic surgery, and that cosmetic surgery should be reserved for people with deformities. Regardless of the apparent generation gap in perceptions about plastic surgery, the industry has become massive. According to the International Society of Aesthetic Plastic Surgery, the value of Korea’s market for related services came in at $4.5 billion in 2011. In comparison, the figure for the global market was $20 billion. Although Koreans have played the biggest role in fueling the growth, foreigners are providing an increasing market for the domestic industry. According to government data, the number of medical tourists coming to Korea has had two-digit annual growth rates in recent years and broke the 120,000 mark in 2011. By nationality, Chinese medical tourists have increased at the fastest rate, going from about 4,800 in 2009 to more than 19,000 in 2011. Aesthetic services account for the largest portion of the growing number of Chinese medical tourists, with nearly 40 percent receiving procedures from cosmetic surgeons and dermatologists. As their numbers grow, services specialized for Chinese customers have sprung up, ranging from clinics that focus on Chinese patients to Chinese-speaking agents. There is even a Chinese-language cosmetic surgery magazine that launched in Korea earlier this year. 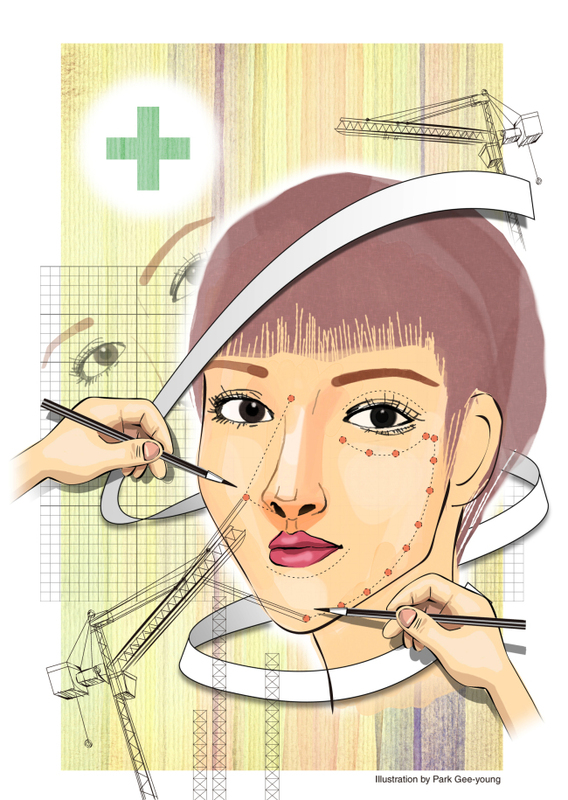 Like any other industry, the plastic surgery industry has seen a number of trends come and go, and a recent one is “gwansang” surgery. Gwansang, or face-reading, is a field of fortune-telling where an individual’s facial features are used to tell her or his fate. Some clinics and even practitioners of traditional Korean medicine offer face-reading services for those hoping that making specific alterations will positively influence their lives. Even experts in face-reading, however, say the effects of such plastic surgery is questionable.